Anti-satellite missiles and orbiting killer satellites, swarms of attack drones, hypersonic missiles, maneuvering warheads, lasers, and high-speed rail guns are key systems China is fielding in the coming years in a bid to leap ahead of the U.S. military supremacy. 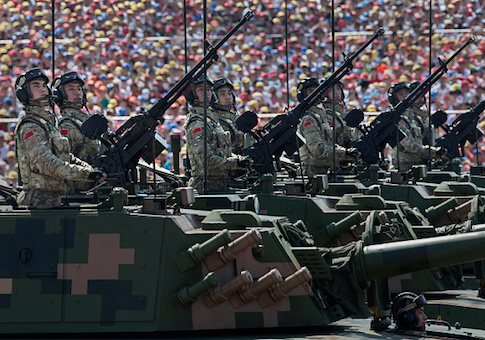 "All of China’s advanced weapons systems are moving forward at ‘full speed' and are all seen as ‘priorities given [China’s] overarching emphasis on finding a vulnerability in the U.S. armor,'" the report warns, quoting a 2013 Chinese military strategy. The advanced weapons are part of a shift in Beijing's military focus from deploying high-technology "informatized" weapons to "intelligentized" arms—revolutionary capabilities boosted by artificial intelligence and machine learning, the report said. The study examined five advanced arms being developed by China: space weapons, unmanned vehicles, maneuverable missile warheads, directed energy weapons, and electromagnetic railguns. "Past history and existing potential point fairly clearly to the likelihood that these systems will become a feature of the strategic landscape in a decade. Or less," states the report from the U.S.-China Economic and Security Review Commission. The report was produced by five analysts for the defense contractor Jane's IHS Markit and made public Thursday. Publication of the congressional report comes as the Trump administration has undertaken a strategic shift that recognizes China as one of the major nation state threats facing the United States. The advanced weapons systems will destabilize the Asia-Pacific region by upsetting alliances as China seeks to control the area and will increase the danger of regional conflicts. The report also concludes the United States is falling behind China in the development of advanced weapons and will have to hurry to avoid being overtaken. "The United States has a small window, only a decade at most, to develop new capabilities and concepts for countering China’s advanced weapons programs," the report said. According to the report, China's space warfare efforts are currently the highest priority. China has demonstrated all components of its weaponry. They include direct ascent anti-satellite missiles, lasers, and high-powered microwave guns and other beam weapons, weaponized orbiting satellites, and cyber anti-satellite capabilities. Other Chinese space warfare support systems include a hyper-spectral imaging satellite designed to detect stealth aircraft and a quantum satellite for secure communications. The strategic competition between China and the United States, from Beijing's view, is designed to counter what China perceives as regional efforts to "contain" Chinese hegemony, the report said. "China views its role as capitalizing on the opportunities presented by globalization and the informatization of society to propel itself forward economically, socially, and technologically," the report said. A key capability the Chinese military is pursuing is artificial intelligence—the fusing of masses of data with high-speed computing to produce weapons capable of reacting very quickly without human intervention. "Artificial intelligence stands out as an especially powerful catalyst of the development of ‘gamechanging' military capabilities," the report said. "China recognizes that AI will transform warfare." AI weapons will greatly help intelligence operators to know the strategic and operational environment, spot patterns and imminent threats, and track enemies very rapidly. Pilots and vehicle drivers also will be relieved by AI systems in mundane tasks of interpreting data streams allowing greater focus on missions of flying or driving. "Drone swarms, autonomous (or semi-autonomous) munitions and cognitive electronic warfare systems all pose new challenges to even the most technologically advanced militaries," the report said. China's development of quantum computing and encryption also will hamper military intelligence collection, a key advantage of the U.S. military. Quantum computing involves the use of emerging technology known as quantum bits that operate differently than digital electronics based on electronic transistors. Quantum computers are expected to be extremely powerful and will assist in the use of AI for both military and civilian purposes. Chinese advanced manufacturing and materials, robotics, and cloud computing also "are improving China’s military capabilities as well as the proficiency of China’s industry to design and build more advanced capabilities," the report said. Among the potent asymmetric weapons China is expected to deploy in the future are large numbers of AI-managed swarm or cluster deployments of unmanned aerial and underwater vehicles and hypersonic glide vehicles. Hypersonic vehicles are launched atop ballistic missiles or from aircraft and travel at speeds of 7,000 miles per hour or greater, making them difficult to counter with air or missile defenses. China's drone weapons are progressing quickly and its defense industry is shifting from copying western drones to developing indigenous systems. Air, land and underwater drones are being developed. Its maneuverable strategic arms include warheads capable of changing course to avoid defenses and a hypersonic glide vehicle that has been tested seven times since 2014. Directed energy arms are primarily for use against satellites, and development of Chinese electromagnetic rail guns has progressed slower than other advanced arms. The study urges the United States to fortify a "quadrilateral" alliance in Asia to counter China, with key allies Japan, Australia, and India. "The appropriate response must gather these overlapping interests and bundle them to American and allied advantage, notably via deliberate plans to understand and counter China’s destabilizing moves," the report said. "China does not stand ten feet tall. It remains vulnerable to internal stresses and discord. Adversaries can play on China’s anxieties and phobias." Utilizing limitation agreements and playing on Russian fears of China also should be exploited by the United States. For example, because China's hypersonic missiles are destabilizing strategic weapons that will be deployed in the not too distant future, the study urges the Pentagon to build hypersonic weapons. "Given the progress in China’s hypersonic research, and an expectation of future production and deployment by late in the next decade, the United States and its technologically competent defense partners, have little choice but to regain superiority in hypersonic glide vehicle capability," the report said. Countering hypersonic missiles also should be stepped up, including the use of electro-magnetic rail guns that fired non-explosive projectiles at high speeds and more advanced missile defenses. The study recommended improving U.S. intelligence capabilities by gaging China's comparative strengths and vulnerabilities with that of the United States to create strategies to maintain U.S. military superiority. The report makes several references to an authoritative 2013 Chinese military report called "The Science of Military Strategy." The strategy says the threat of a large-scale ground invasion is minimal but that the major threat will be an attack from the Pacific. "The most severe war threat is a large-scale strategic sudden attack launched by a strong adversary, which aims at destroying our war potential to force us to surrender," the strategy says. "The most probable war threat is a limited military conflict from the sea. The war we need to prepare for, particularly given the background of nuclear deterrence, is a large-scale and highly intensive local war from the sea." China is stepping up efforts to steal or buy foreign technologies related to artificial intelligence and big data analytics. Other targets include the Internet of Things, virtual reality and augmented reality, smart sensors, 3D and 4D printing, robotics and unmanned systems, smart materials, quantum computing and encryption, semiconductors and energy capture, and storage technologies.